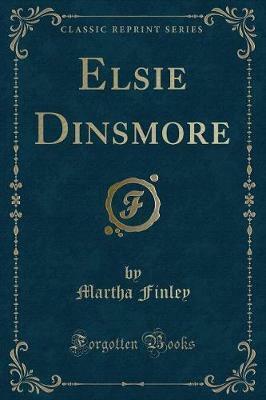 Excerpt from Elsie Dinsmore "I never saw an eye so bright, And yet so soft as her;It sometimes swam in liquid light, And sometime swam in tear;It seemed a beauty set apartFor softness and for sighs." - Mrs. Welby. The school-room at Roselands was a very pleasant apartment; the ceiling, it is true, was somewhat lower than in the more modern portion of the building, for the wing in which it was situated dated back to the old-fashioned days prior to the Revolution, while the larger part of the mansion had not stood more than twenty or thirty years; but the effect was relieved by windows reaching from floor to ceiling, and opening on a veranda which overlooked a lovely flower-garden, beyond which were fields and woods and hills. The view from the veranda was very beautiful, and the room itself looked most inviting, with its neat matting, its windows draped with snow-white muslin, its comfortable chairs, and pretty rosewood desks. 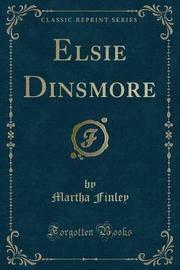 About the Publisher Forgotten Books publishes hundreds of thousands of rare and classic books. Find more at www.forgottenbooks.com This book is a reproduction of an important historical work. Forgotten Books uses state-of-the-art technology to digitally reconstruct the work, preserving the original format whilst repairing imperfections present in the aged copy. In rare cases, an imperfection in the original, such as a blemish or missing page, may be replicated in our edition. We do, however, repair the vast majority of imperfections successfully; any imperfections that remain are intentionally left to preserve the state of such historical works.